Belif Eye Bomb is a type of eye cream that enhances smooth lines, boosts elasticity and surges the resilience of the skin for a perfect makeup experience. It is a product that leaves a fresh sensation and has no effects of irritation on the eyes, tiredness, and rubbing that is evident in most makeups. It combines high-quality ingredients such as comfrey leaf that is significant in skin hydration and pennywort that boosts elasticity. This cream ensures that the skin is moisturized and firm for over 26 hours after its use. Apart from being an eye cream, this product can also serve the purpose of makeup as it sinks into the skin even before the application of a concealer resulting in natural and smooth skin texture. It supports all the skin types from oily, combination, normal, and sensitive to dry. This cream is available online and the brand’s official website. LG Household & Healthcare is the manufacturer of Belif Eye Bomb and originates from the Republic of Korea. It produces various facial creams under its name. The manufacturer offers customers compensation if there are any defects found in the product. This product claims to boost elasticity of the layers of skin and increase the skin’s resilience. It also promises to maintain hydration on the surface surrounding the eye and eliminates the appearance of aging signs like wrinkles and lines. Belif Eye Bomb works by utilizing two high-quality ingredients to ensure the skin surface is fully hydrated for an extended period and increases the elasticity of the outermost and innermost layers of the skin surface with no effects like irritation. Comfrey Leaf – Rich in Vitamin C and Calcium that is significant in speeding the process of healing. It also detoxifies the skin leaving it soft, glamorous, smooth and bright. Pennywort (Tiger grass) – An herb that originates in some parts of Northern Australia, Sri Lanka, India and Asia. It facilitates the production of natural collagen, slows the process of aging, it prevents joint pains and swelling, improves mental performance and reduces fatigue. Dipropylene Glycol – Made up of three isomeric compounds and acts as a solvent in such products and also crucial as a fragrance. Cyclopentasiloxane – A type of silicone and can be used as a conditioner, lubricant, solvent, and delivery agent. 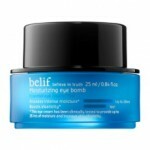 Belif Eye Bomb Review – Does It Really Work? Belif Eye Bomb claims to perform its functions efficiently according to the manufacturer. It helps increase the resilience and firmness of the skin. Pennywort ingredient slows the process of aging, suppresses joint pains and has anti-bacterial, anti-inflammatory properties. It can eliminate the signs of aging like wrinkles. It ensures the skin surface remains hydrated. It may transform the skin too soft, smooth and clear. It causes eye irritations and frequent rubbing. It does not eliminate lines and wrinkles on the skin around the eye are noticeable after the use of the cream according to customer complaints. Wash your face and concentrate more on the eye. After the use of a moisturizer, smear the cream on the skin around the eyes using your index finger gently and pat it lightly for quick absorption. It should not be used for more than six weeks consecutively. The manufacturer warns that the user to use the cream for external purposes only, keep away from children and, should not be used by pregnant women as it may lead to miscarriage you should avoid a direct contact with your eyes. For optimum results, ensure the area of application is clean. The results are instant due to the presence of ingredients that speed up the process of absorption. However, the improvements will vary from one person to another depending on their way of handling and use of the cream. This product has side effects like causing irritation and rubbing after application especially around the eye. The ingredient pennywort can cause some harm to the liver, increases blood sugar and cholesterol levels. You should seek the consent of the doctor before using this cream. Belif Eye Bomb is cream that claims to slow the process of aging, surge the elasticity and resilience of the skin and make the area of application smooth and soft. It helps moisturize the skin, maintains hydration and enhances the production of collagen in the body. The product also improves mental performance and reduces fatigue. The cream absorbs into the skin immediately due to its lightweight form and suits all the skin types. It also claims to be a makeup alternative, prevents joint paints and swelling and contains both anti-inflammatory & anti-bacterial properties. The manufacturer offers compensation when the product has any defects. However, the cream has various side effects like irritations, increases blood sugar levels, pennyworth may be dangerous to the liver and is expensive for a supplement. You should also research on other products that claim to offer same benefits as this formula. This helps you make a final decision and settle on the best product among them.